'One' Pangi Budra is the subject of a land acquisition notice dated 1954. A bit of his life can be reconstructed. The rest is conjecture. Pangi was one among the 2938 families affected by the Machkund hydroelectricity project. It was one of India's earliest, and Orissa's first. About 10,000 Paraja and Gadaba tribals lost their land and forest. As Sanatan Misra, a revenue department official who looked after the Machkund project rehabilitation programme in the 1950s, recalls, many of these people just vanished. "When the water came, they just went like flocks of flies," Misra says. In the late 1940s, as the Machkund dam neared completion, people had no choice but to buzz off like flies. The project was completed in 1948. Four years later began a rehabilitation programme. Revenue officials including Misra swung belatedly into action. A flurry of land acquisition notices were handwritten, one of them Pangi Budra's. Pangi Budra never got the piece of paper that would have allowed him some rights, or recompense. But it is possible that Pangi was already resettled upstream. He could have been one of those that didn't vanish, but chose to re-implant themselves in the forest upstream of the Machkund dam. He could already have adjusted to life in any one of the 30 villages that came up there. He could already have had performed, like his re-settled fellow Parajas, the year-long ritual of calling back the spirits of his ancestors from the old place to the new one, thus legitimising the sanctity of the new one. But this is conjecture. There's nothing conjectural about the vast Chitrakonda/Balimela reservoir -- part of the Balimela hydroelectricity project commissioned in 1962. When the reservoir began to fill up, it submerged 700 hills. 91 villages were displaced. Many villagers didn't opt for rehabilitation, for the land they were offered at the camp had no water or forest. Many more couldn't. Only those are fit for compensation who possess legal documents of land ownership. The affected Paraja and Dadiya tribals had none. So, from these 91 villages too, people merely migrated. They vanished as the water filled up. Did Pangi Budra also vanish with them? What the water also did was to maroon another 150 villages, including the 30 that had escaped the Machkund flood. 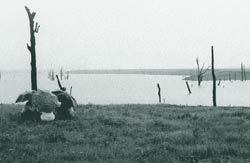 The reservoir sent the villages on an unprecedented geographical spin: from being part of the mainland, the villages became islands. The government contributed with a googly of its own. Because the water didn't drown them, the government did not consider these villages as project-affected. Indeed, of these 150 villages the government considered only one as 'displaced'. 150 became part of what the government calls a "cut-off region". Officially isolated, forced to remain remote, these villages today have fallen off the country's map. They do not exist within any administrative calculation. They remain outside the nation's collective memory. They are dregs of development, just like Pangi Budra. Says the official history book of Even as people, and villages, fell off the nation's development blueprint, the country continued to grow. The state refused to learn. Up came the Upper Kolab project in the 1980s, about a 100 km from the Balimela reservoir. A faulty assessment of the submergence level cut another 40 villages off from civilisation. Says the official history book of the Upper Kolab project: "In the rehabilitation policy of government there was no provision to help these people." For the Machkund dam too, there was none. In the Balimela project, people were offered 5 acres of land, and no money. The Upper Kolab compensation package was kingly by comparison. Government established resettlement camps 80 km away from the project area and asked people to shift there, or take a flat rate of Rs 14,050 and self-rehabilitate (see box: New Home). In the camp, people were promised 3 acres of irrigated land, or 6 acres of unirrigated land. Those who reached there were given 3 acres of unirrigated land. And all the rainfall they could put to use! The low compensation of assets is based on the principle of 'eminent domain': land without a patta is terra mullius, or 'nobody's land', open to acquisition by anybody. Government can easily acquire such land, for 'public purpose'. So can a private party. But only government has the right to define 'public purpose'. And Indian law does not recognise the socially established community rights that are basic to the livelihood of those who depend on common property resources. Today, Orissa's undivided Koraput district has the distinction of being India's largest electricity generating district. Its numbers of the displaced are also the highest. Orissa had two large dams in 1950; 149 by 1990. The district itself has 18 major hydroelectricity and defense projects occupying 2000 sq km of its total area of 26,961 sq km. Out of all the 'installed capacity' in the state, about 40 per cent comes from this district. It shares 57 per cent of all planned capacity. The undivided Koraput district's 55.22 per cent population are tribal and account for 70 per cent of the state's total tribal population. Out of the state's 62 tribes, 56 are found here. 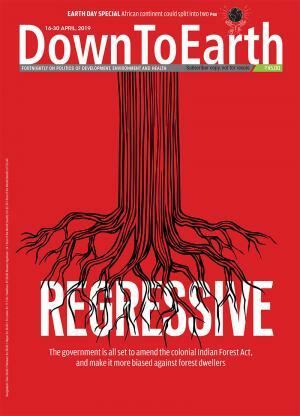 According to a study by the Indian Social Institute, around one lakh tribals were deprived of their lands by these projects, including 4,00,000 acres of forest on which they depended for their livelihood. Referring to the 40 marooned villages, says the official history of the Upper Kolab project: "Problems of inadequate communication facility would remain for some time till people in the vicinity are used to country boat movement in major routes inside the reservoir". To serve the 150 marooned villages, the Balimela project authorities began a steamer service in 1971. A lone steamer reaches 10 reservoir-side villages, the last a distance of 68 kilometres from Chitrakonda on the mainland. In this region cut off from the rest of the world, the lone steamer is everything. So what would happen if it didn't run for a day? This almost happened on Wednesday, July 17, 2003. At Chitrakonda, Pitambara Parida -- the pilot -- finds the battery is low. There is dismay. "A few minutes of delay means a lot of suffering for us," said Ghasi Khar of village Dangarpadar, which requires a six-hour 37-km sail and a further 8 km walk to reach. That day, the steamer starts 2 hours late. That means it will reach its last berthing point at 2 a m in the morning. Worries Ladka Mudli, "It has rained today. I have to till the land by tomorrow. The tilling is already delayed by one month." He has already spent 3 days to fetch 2 kg of seed. "If I don't reach by tomorrow the land will again be dry, as it is on a hill slope." Ladka has already lost 3 days of wage-earning in his village. If he spends the next few days tilling, as he plans to, he would lose some more. At the forthcoming weekly market on Sunday, he may not have the cash to buy ration and kerosene. Ladka Mudli shivers. He is thinking of impending starvation. Outside it is raining. The steamer -- packed with 80-100 people and sacks, cans, canisters and all kinds of goods -- chugs its way through an increasingly grotesque landscape. Hills keep their heads above water. Stumps of trees stick out of the water, like accusing fingers. The stumps are in thousands. Parida says travelling over submerged forests is extremely dangerous. An unseen treetop could rake the steamer's bottom badly, or even topple it over. So, throughout the 68 km the steamer has to go, it chugs along at a careful 7-8 km/hour. Parida navigates by both habit and instinct. He has learnt to navigate at night by recognising shapes of different hills and major patches of forest. But things like fog, or the rain now pouring, can change configurations. The reservoir is filling up fast, he says. For the next few days, he would have to fix other, different co-ordinates. How can a low battery cause people to face the prospect of starvation? How can a lone steamer affect an entire village's annual crop yield? Indeed, smoothly run or bring to a juddering halt an entire economy? Isolation has precipitated a distress economy. Earlier, villages existing in valleys controlled the local economy. They generated surplus foodgrain; this had a ready market in villages higher up in the hills. All the valley lands -- most fertile, maximally yielding -- are submerged now. Now there is no surplus. This in itself is an immense, perpetual cause of food insecurity, hastened by a larger population's demands for scarce arable land. The result: more forests on hill-slopes are cleared for cultivation. It isn't easy to cultivate on hill-slopes. The land is less yielding, and does not support more than one crop a year. Agriculture provides food for a maximum of four months in a year. Again, clearing forests means the loss of another food source, particularly during the crucial four months of the monsoon, when, for people in these villages, there isn't snything else to depend upon. In 2002, the Malkangiri Organisation for Development and Education (mode), a non-governmental organisation, carried out a socio-economic survey in the cut-off areas of the Balimela reservoir. 50 per cent of the people were found landless. Food security was the least compared to the rest of undivided Koraput district. Isolation has precipitated other changes. Bangladeshi refugees, predominantly fish traders, have turned a rice-cultivating people into fisherfolk. 60 per cent of the Paraja and Dadiya people now fish and sell their catch to these traders. Over the years, these villages have institutionalised a labour-sharing system. It is called bhuti, a derogatory word Oriyas use to denote a slavery-equivalent. A villager lands up at somebody's land. He tills, sows, harvests. He is paid Rs 5 for a day of work and given a free lunch of watered rice or plain rice water. As Raghu Mudli of village Orapadar explains, "Everybody knows the bhuti is for the few crucial notes that run the outside world and are a luxury here. So nobody refuses anybody". But this system works for 2 months in the monsoon, and 2 harvest months. On average a villager can manage to earn about Rs 500. With this, he must plan out the ration for the entire year. The steamer berths at a point 37 km from Chitrakonda. From here, it is a 4 km walk to village Orapadar. One of its residents, 75-year-old Lachhi Palasi, has been to Bhubaneshwar (see box: Seeds of change). The streetlights -- lit by electricity from Balimela -- blinded her, she recounts. "We thought our land was yielding something new called electricity and villagers just felt proud to agree for the project," she says. "But why can't they get us electricity in our village?" Lachhi is now a village leader. She is consulted widely -- for family feuds, for weekly budgets, or which market to go and what ration to buy. She has never forgotten how her husband died of malaria. Cerebral malaria is rampant in the Balimela "cut-off region". (Koraput has Orissa state's highest fatality rate from malaria.) Those who wish to access the nearest hospital, 80 kms away, have to cross the reservoir by boat or the lone steamer. Such people often die on the way. Parida has already talked about this: "The steamer has become a sailing death bed, many times". According to the mode survey, the Paraja and Gadaja tribals show a declining growth rate due to untimely deaths caused by high infant and material mortality, malaria, frequent attack of water-borne diseases and rampant malnutrition among children. Those affected by malaria frequently remain incapacitated for at least 15 days a month, leading to income loss. Soma Mudli of Orapadar says he is jibon mrutyu majhire, between life and death. As he tills his land, a brown patch on a hill slope, he is already predicting a bleak future. After two years of drought, the village doesn't have any seeds. So Soma had to work as a daily wage labourer in others' lands, in exchange for a few handfuls of seeds. "That is what I have got now to save myself from starvation," he says. His preoccupation for seeds has taken time away from collecting forest produce, to be consumed during the monsoon months. "I just have two days of bamboo shoots," he calculates. To till the dry land he has hired a pair of bullock for a month. It has cost him Rs 300, probably his total earning from the monsoon crop. Chances are hunger will knock at his door. Will Soma manage to avoid the starvation death his father died of two years ago, which he remembers? Earlier, Orapadar existed in the valley, guiding the economy of 50 villages. "This village had more plain lands and a few perennial streams, thus ensuring irrigation for the whole year," says Narayanan, a social worker who distributes seeds. Now its 50-odd families have one acre of upland each. The village's economy has turned turtle. According to residents, food from agriculture now lasts only for three months. Now nobody sells the cultivated crops. Seeds, too, are not available. Expenses are up. For one kg of salt Orapadar residents spend Rs 30. The salt and kerosene ration available in shops -- run from individual houses -- costs 2-3 times more. "It has become a 100 per cent buyer economy," informs Thakur Das of mode. As we walked from Orapadar to Dangarpadar village further inland, people talked about the school teacher's extended summer vacation. He's not been seen in recent times, but people remember his vacation began on May 15. They speculate it may extend to eternity. They also speculate the teacher might one day land up by steamer -- usual practice -- to mark himself 'present' and so justify his salary. If he appeared now, he was sure to call the children to the waterside. This was tilling time; it would be a huge wastage of human resources. It could hasten them another inch towards hunger. A government official, in charge of distributing old-age pensions to about 300 villagers, has been spotted in the steamer! By next day he was on his way back, although even in a mechanized society it takes more than a night to distribute old-age pension in 150 villages. For government officials, this cut-off region is a highly profitable cash crop. At least 15 projects are under implementation here, with an annual investment of over Rs 75 lakh. "Government exists, the officials exist and prosper," says Ghes Khar, an influential community leader of the cut-off region. "Only the beneficiaries, the 150 villages, don't exist." This existential dilemma has set the residents of Dangarpadar village on a spiritual sojourn. Out of the village's 22 families, 16 have adopted the religion of Bhima Bhoi, a nineteen century poet who led a fierce battle against poverty till he turned blind. Dressed in customary saffron, Sitaram Pangi says: "God was the only hope." He adds: "But like government god has also forgotten us." Dangarpadar has grudges against all reservoir-side villages such as Orapadar. "They can have a few acres of extra land if the reservoir is not filled up," says Padlam Khar. With just 15 acres to be carved up among its 200 residents, this village decides who will starve and who will eat. "One year a villager takes up a bit of vegetable cultivation to earn decent money by selling. The next year, some other resident is allowed to do that," says Khar. Water is also scarce. Many forest-bearing hills have been cleared, thus drying natural streams. Streams are the only source of water in non-monsoon period. Moreover, the denuded hills can no more hold the monsoon water for months. This shortens water availability even during the monsoon. For drinking water, villagers walk miles, virtually searching for unexplored streams to occupy for exclusive use. Dug wells are a major loss of effort: the groundwater level depends on the water level in the reservoir. In the last two years, due to less rainfall, the reservoir level reached an all-time low and a dozen dug wells dried up. "For months we didn't drink water and survived on rice water," says Lachhi. Village Kechla in the Upper Kolab reservoir is the least cut-off from civilisation. It takes an hour to reach by country boat. Placed on the slope of a hill, the village is preparing its weekly budget. In summer, say villagers, when they sail for the mainland, their village submerged in 100-150 feet of water can be seen. But, they say, few want to see. That Kechla used to supply vegetables and sugarcane to many towns in south Orissa. The road from there to Koraput was known as the 'silk route' for its high value trade. Ask Haridhan Mudli. He was once the richest resident of the village: almost half of the submerged land in the vicinity of the village belonged to him. "About 100 fruit-bearing trees were there and I was the merchant that traders from Koraput used to beg from," he says. Submerged in the reservoir, the 'silk route' continues as it was once the mainland is reached. Thaka Kadari, walking on this stretch -- eerily it climbs out of the water -- becomes nostalgic. His four brothers left him and migrated. Where to, he doesn't know. "The option of staying cut off was too hard for them," he explains. "But I was grown up and had a family to grow with forest and lands." His family is now 10-members strong, and resources are shrinking. His five sons with their families share the same land and earn livelihood for just two months. As his family grew he has been clearing hill slope for agriculture. "But the more you climb the less and less yield you get," he says. Clearing the forest itself is a resource irremediably lost. "During the lean months we explore the nearby forests and survive on roots and tubers." Ori Jani is the pride of Kechla. Her son is the village's first child to reach class ii, and stays in a hostel. But she is also a worried mother. For more than a month now, she hasn't received any news about him. The few words about him that reach her are virtually transmitted through a dozen people. Her son searches for residents of his and neighboring villages in the weekly market in Koraput and passes on a message of his well being. Also, Ori is not happy with him. She needs a helping hand in clearing the hill slope for the next monsoon. "It takes a year to prepare a patch of land," she says. She intends to bring him back. But to do that, she needs to earn about Rs 50. Crossing the water requires money: a one-way trip to the mainland costs Rs 20. Add to it money to buy salt and oil. The only thing the village uses as cash money is fuel wood, still in demand in the mainland. So the village's weekly budgeting is done very meticulously. Women sit together, take stock of their respective cash needs for the week and than venture into the forest. They go by boat, sometimes six to seven km into the reservoir, or by a dangerous trek through half-submerged hills. It takes 12 hours a day and about 20 kms of walking to collect a bundle of fuel wood. Usually, women spend five days a week collecting five bundles. This fetches Rs 100 in the mainland market. Ori has to venture into the forest for at least three days just to bring her son back to the village. So to take care of her ration for the week, she has to spend all the seven days collecting fuel wood. Kechla villagers say they are much luckier than the ones in the Balimela reservoir. "But here, too, survival is full of similar impossibilities," says Sanjiv Patnaik of the South Orissa Voluntary Association, a Koraput-based ngo. Back on the mainland, an argument runs to the effect that a land connection does exist to these 190 villages in the Balimela and Upper Kolab reservoirs. This is the only debate these villages feature in. The basis for it is a government plan for a bridge to link the cut-off area with the mainland. For the record, there is no land connection. Only an argument of mythic dimensions. Mamata Madhi, the local member of legislative assembly (mla), believes there is a road. "I have not visited the region, as such a long walk doesn't fit into my busy schedule," she says. She says, "Had it been a matter of lakhs of rupees, steady developmental work would have been taken up by the administration. Sadly, it is a matter of crores. And the state government doesn't want to invest such a huge amount which has no return." Madhi has already prepared a voluminous proposal to get "return" from the cut-off region: the areas are to be developed as a tourist haven. Let Lachhi, of village Orapadar, serve a reminder to Madhi's plans: "Bhubaneswar got electricity from our land, pushing us into perpetual darkness. What else they want as return?"